I’ve been on a chocolate and peanut butter kick lately. The problem is that I’ve also been on a health kick. 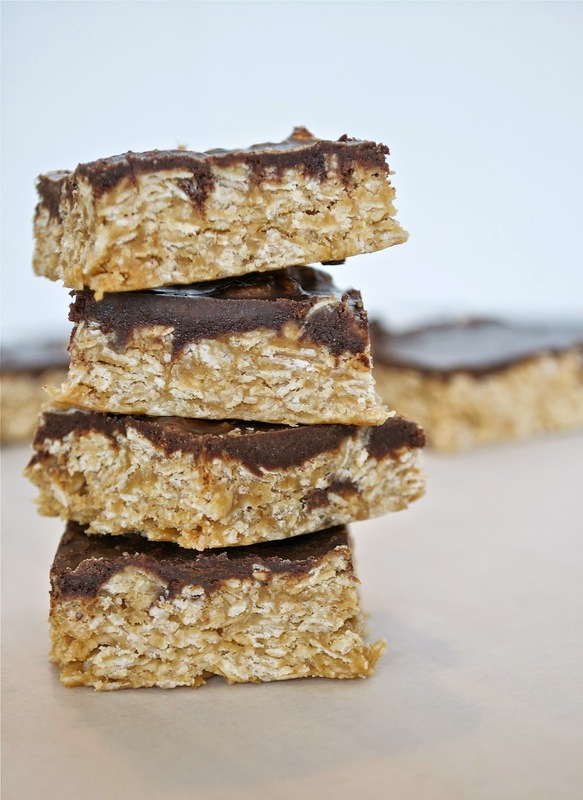 The solution to this problem is these Chocolate Peanut Butter Oatmeal Squares. Not a single drop of added sugar and nothing processed either. Just plain old, melt in your mouth, chocolatey goodness. I made them for a work potluck the other day and they were a hit. Nobody could believe that they were actually not bad for you after they tasted how good they were. 1. Line a 9 x 13 in pan with parchment paper. To make the bottom layer, melt honey, peanut butter, coconut oil, vanilla and salt over medium-low heat, in a medium sauce pan. Once everything is complete melted, add oats and stir well until everything is combined. Press into pan and set aside. 2. Rinse and wipe out sauce pan. To make top layer, heat cocoa power, honey, coconut oil and vanilla extract over medium heat, just until it begins to simmer. Remove immediately and pour over the bottom layer. 3. Place in the freezer for about 1 hour or the fridge for a few hours until completely set. Remove from pan and cut into squares. Store in a sealed container in the fridge.